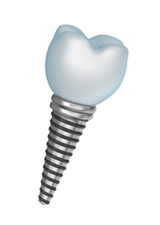 A dental implant is a special alloy post – that is usually made of titanium – which acts as an anchoring point for a dental crown or other dental apparatus. How this works is the dental implant is inserted into the jawbone carefully and safely by our team. After the jawbone has healed, then a beautiful porcelain crown is attached (effectively creating a new tooth), or a dental device – such as a denture – is placed. Some parts of the mouth are hard to get to, and it can make it harder to place a normal dental implant. Now, thanks to modern dental technology there is an option for those harder to get to areas called mini dental implants. Mini dental implants act a lot like their larger counterparts, except they are smaller and designed to fit into tighter spaces. These mini implants have been a wonderful solution to tight situations, and between standard size dental implants and mini dental implants we can resolve more missing teeth situations than ever before. Mini implants have another use besides just a place for anchoring a dental crown or dental device, and can be used as a form of introduction to dental implants in general. Smaller | Because they are smaller than standard dental implants, they can be placed in tighter spaces, or spaces that have less bone structure available. Support | As with a non-mini dental implant, a mini implant can help improve the support of your jawbone. When you lose teeth it removes some of the support necessary to keep your jaw happy and healthy. By using dental implants and mini implants in most cases the strength of your jaw can be improved. Our team have loved being able to use this wonderful dental technology to help patients who have lost teeth get their smiles back. We work hard to stay on top of the latest and greatest treatments, so that our patients can benefit from our expertise. Have any questions about mini dental implants, dental implants, or any of our other services that we offer at our Fresno practice? Contact us today and schedule a consultation with Dr. Art Mirelez if you are in the area, from Madera to Clovis!